Healthy productive gardens will provide more vegetables than you can use fresh, so preserving the excess for cooler seasons is an important step in harvesting your garden. Freezing your vegetables is one of the easiest ways to preserve your extra food. Spend a weekend freezing your garden overflow, and you'll have vegetables for months to come. 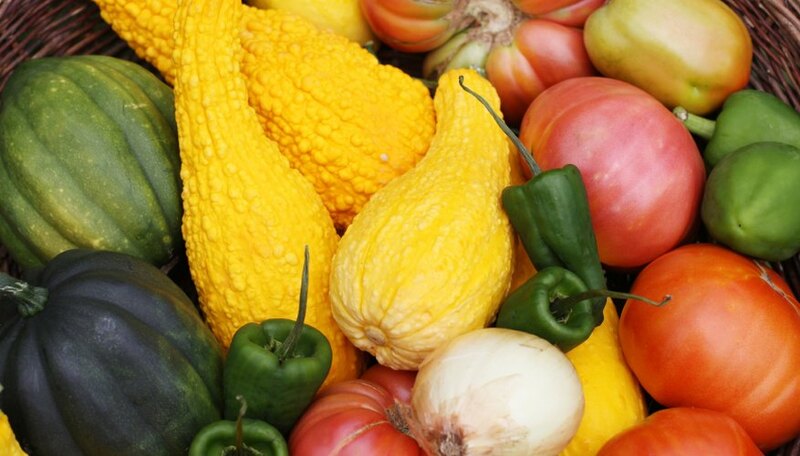 Choose perfectly ripe vegetables, free of blemishes or rotting spots. If any small spots are present, cut them off. Peel vegetables with skins, such as tomatoes and squash. Chop vegetables into small, uniform pieces and wash thoroughly. Fill the pot three-quarters full of water and bring to a full rolling boil. Drop the vegetables into the water to blanch, which stops enzymes that deteriorate food and preserves nutrients. The time to blanch your food varies depending on the food variety, and can be found in a food blanching chart from the National Center for Home Food Preservation, among other places. As soon as the blanching time is up, use the slotted spoon to remove the food from the boiling water and drop it into a bowl filled with ice water to stop it from cooking and to cool it. When the food is cold, remove to a strainer and drain completely. Remove as much moisture as possible, then pack into freezer-safe containers, like freezer bags or plastic freezer containers. Pack food in serving-size amounts, making sure that there is as little room as possible for air in the package. Place the packages in the freezer immediately and leave until frozen solid.